How nice is that? 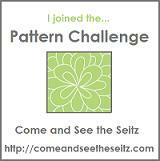 I’ve visited Elizabeth’s blog E Made This several times since finding her on Sew Mama Sew. She is a great sewer and has a super cute baby boy. I understand that I’m suppose to thank the person who nominated me, (thank-you, thank-you) , share seven interesting things about myself and the best part is I get to nominate seven more bloggers. That part should be easy, I read a lot of blogs. I also get to paste this award on my blog and link it back to Elizabeth. Which I really hope I’ve done correctly. 1. I haven’t shared this blog with anyone I actually know. 2. I love creating things and spaces. I need to do this or I feel lost. I love my home. 3. I have a marketing degree which I never really used. The economy wasn’t great at the time I graduated. I moved in with my now husband in a rural area and found a retail job at a fabric store. I figured if I had to work retail I had better like the product. I now work part-time in a paint store. I sometimes wish I’d had the ambition or confidence to get a real job in my field. 4. I’m a life time member of Weight Watchers. I’m roughly 20 pounds from goal but I’m back going to meetings and have lost about 13 pounds so far this time round. 5. I spend far too much time playing minesweeper. I think I might be beating this addiction now that I have high-speed. I use to play it while waiting for pages to open. 6. I like being alone. I love an empty house. I love knowing they will all come back safe and sound but, I love my alone time. Give me more. I ask for it for Mothers’ Day and friends think I’m mean. Oh well, it’s what I really want. 7. I’m terrible to buy for, just ask my husband. I take everything back. I try not to now that my daughter shops for me. I really don’t want to hurt her feelings. She is getting better at knowing what I like though. It’s terrible to open a gift and ask where they got it because I’m thinking about returning it. I hate money spent on things I don’t love. That’s it. Not wonderfully interesting I suppose but, that’s all your getting. 1. Irene from Mushroom Villagers. 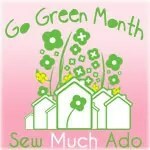 This was the first sewing blog I ever followed and the first to comment on mine. 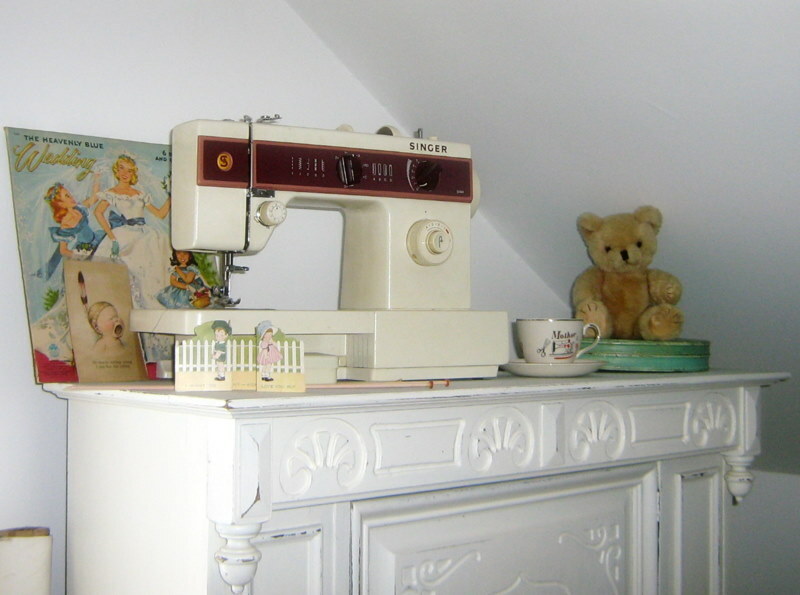 She is really busy with Sew Mama Sew and hasn’t posted a lot lately but she has a wonderful blog that I still like to read. 2. AppleCyder is another blog I really enjoy. I love her photography . 3. Bethany from Craftopia is a great designer. She has a new blog that I’m really enjoying. 4. Tammie from craftytammie is so talented. I’ve seen some wonderful cakes on her blog that I am going to try to recreate. 5. casapinka makes me laugh. She is an amazing artist and has a wonderful eye. 6. Julie from Color With Stitches has made some beautiful quilts that I wish I had the patience to make. 7. Pink Penquin has a beautiful blog. She is even silk screening her own fabric. Something I’d love to try one day. So this has been fun. I hope everyone can pass this award on to other blogs that they enjoy. 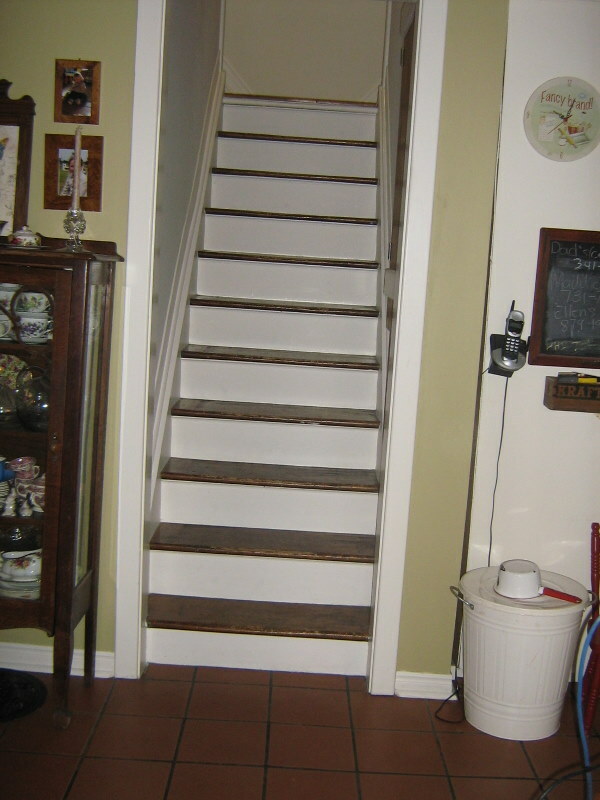 I love love my new stairs. This isn’t the greatest picture. It has been raining and and it really overcast today. They are shiny but that will reduce a little with time. This is what I see when I look over my shoulder from the computer. Lovely view. It’s really not such an orangy red in person. I can’t wait to hang the red and white quilt but, alas I must. I need to get a piece of wood cut for mounting. Where is everybody? UPDATE: Quilt has been hung. Have I mentioned I believe there is a conspiracy in my family to keep me from actually finishing all decorating projects… well I have evidence. 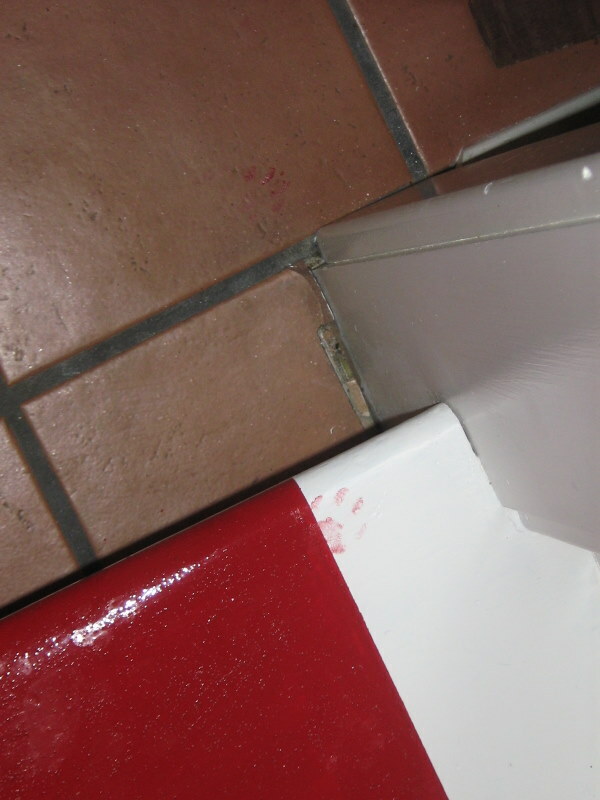 Yeah, when I touched up the white, he walked through that too. Give me strength. Cindy from Random-Charm said something in her comment on SMS, about painting that really made me think. She mentioned she grew up in a military family and they didn’t live in houses that they owned so her family never really painted their homes for themselves. I on the other hand spent 18 years in one house, then 6, and now 18 years in this house. Wow I’ve never looked at it like that before. My mother loved to decorate. She was and still is always painting, wallpapering,refinishing, sewing and crafting. Her brother owned a paint store and she worked there from time to time. And can you guess where my part time job is?… wait for it… a paint store! Decorating has really been a big part of my life. When we where kids my parents use to buy houses fix them up and sell them. I can’t tell you how many rooms I’ve painted. I still paint for family and friends but usually only if they let me pick the colours. Really. I sometimes am amazed by people who buy furniture and decorate like once in 30 years. wow eh? Not for me. Just think of all the money I’d have if I didn’t decorate constantly. I really do it to help the economy though. You can thank me later. I waited for the store I work at to get this new Frog Tape that I saw demonstrated and when we finally received it I realized it was specifically designed for use with latex paint. oh well. I have already decided I wanted to go for the oil-based so I gave it a try anyways. It is a little stronger than some painters tape and it actually took some paint off. Right down to the wood! 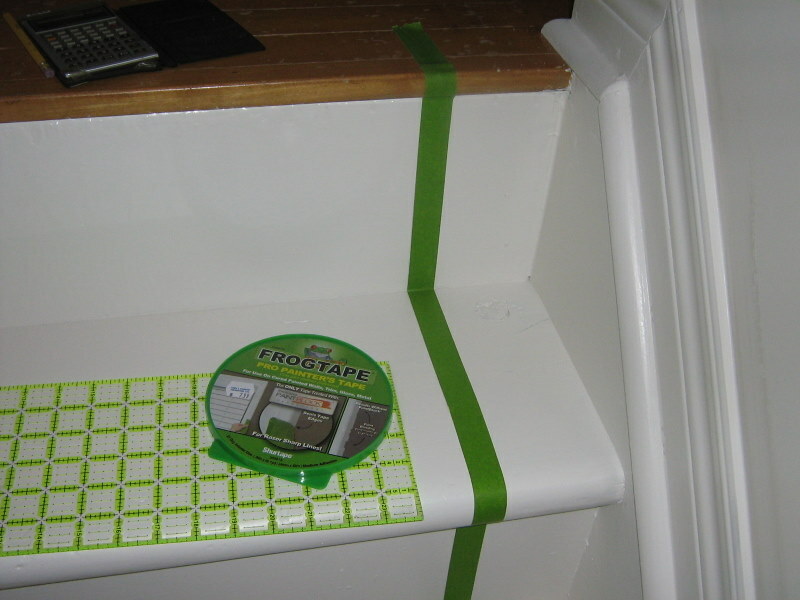 I used regular painters tape on one side and the Froggy stuff on the other. They both did a good job but oil paint wasn’t what the frog stuff was made for. Anyhoo. I’ll be getting a piece of wood cut to fit over where the wires are runner. Just ignore it like I am for now. I decided on a 24 inch runner and my quilters ruler worked perfectly. Things aren’t exactly square around here so I had to fudge the lines so they looked fairly straight even if they weren’t. I don’t have any pictures of the red quite yet. I’m doing touch ups tomorrow and then I’ll take a few lovely pictures. I hope. 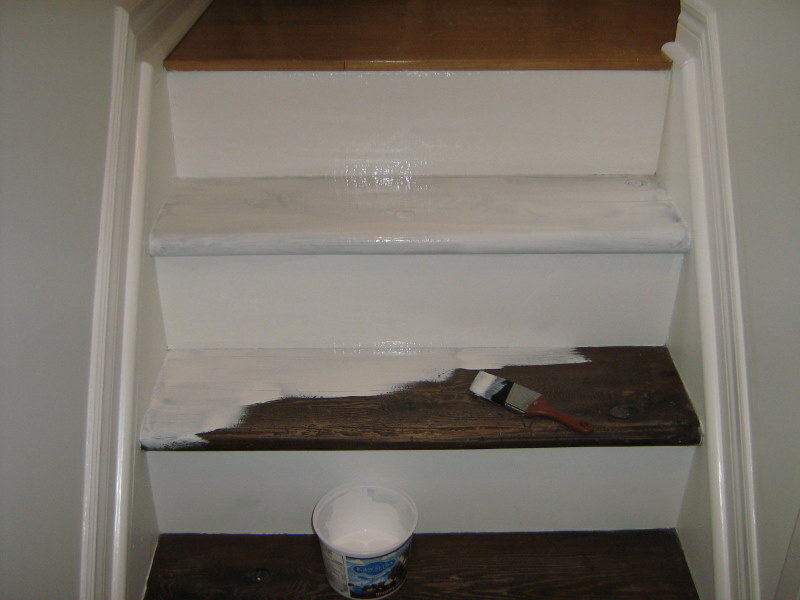 I have used a product called Safe Tread to add to the final coat. 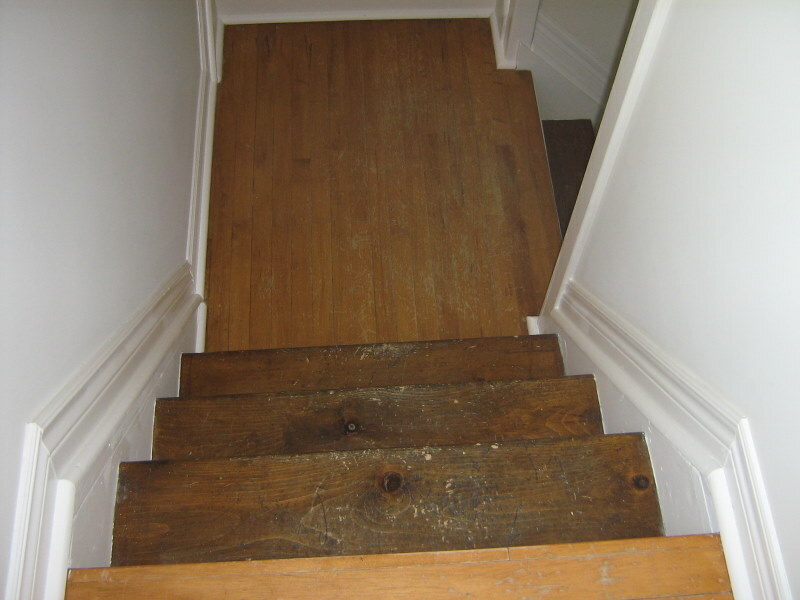 It is a sand product that will make the stairs less slippery. 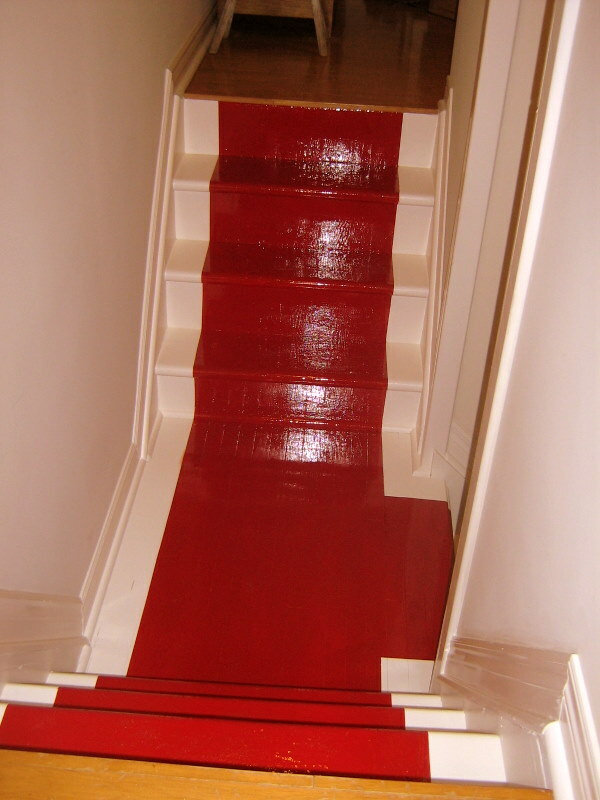 After the first coat without the Safe Tread I realized that someone would eventually end up prematurely at the bottom of the stairs. lining fabric, face fabric, mounting board, screw eyes, shade cord, plastic rings, weight rod, white glue, staple gun, L-brackets, screws, cleat to anchor cord pulls, calculator, pencil, paper, and patience. First thing is deciding on the placement of the shade. I wanted an inside mount so I measured the inside width and height of the window. Since the window was narrower than 54 inches, I knew I would just have to purchase fabric the length of the window plus enough for a fold over on the top and bottom. I allowed 3 inches on the top and 5 inches for the bottom. So 64 inches (inside height of window) + 3 (top fold over to attach velcro) + 5 (flap at bottom, weight rod pocket and 1/2 inch seam) = 71 inches. I always buy a little more so I have enough extra to square up the fabric. 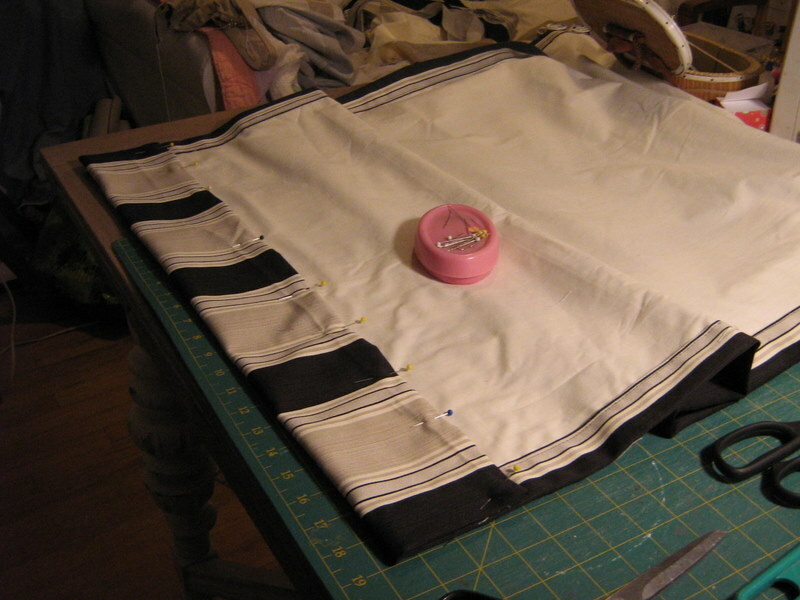 If the window was wider than the width of the fabric I would have had to join the fabric to make it wide enough. I have had to do this before and it is nice if you can do something with the seams, like, add piping, or a contrast band or ribbon. 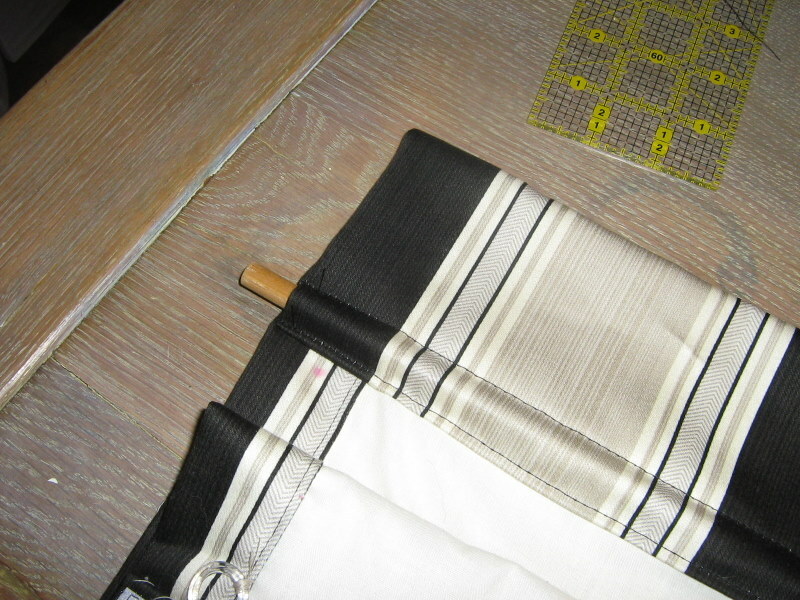 I chose a nice black, beige and grey stripe with a cream lining. Greige a new favourite. 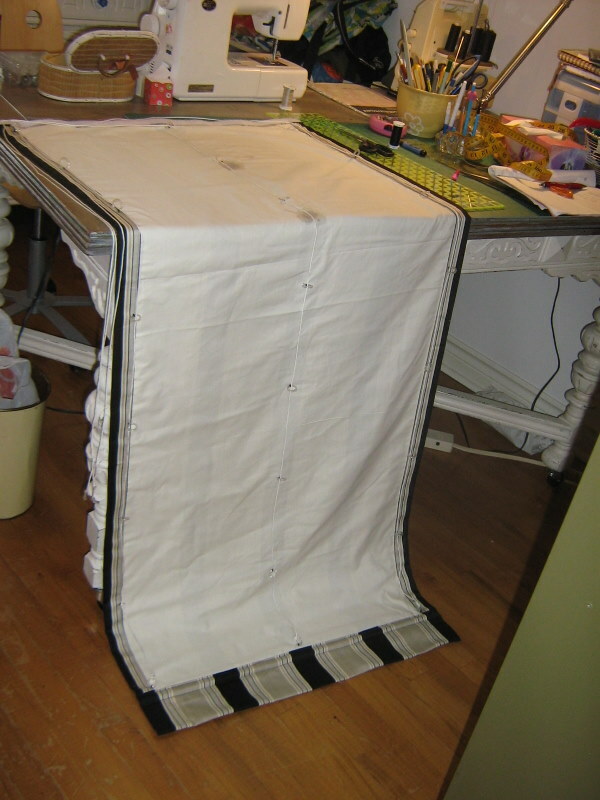 I take great care to square up the fabric, otherwise it won’t hang straight in the window. Since there were various stripes I also centred them on the vertical. 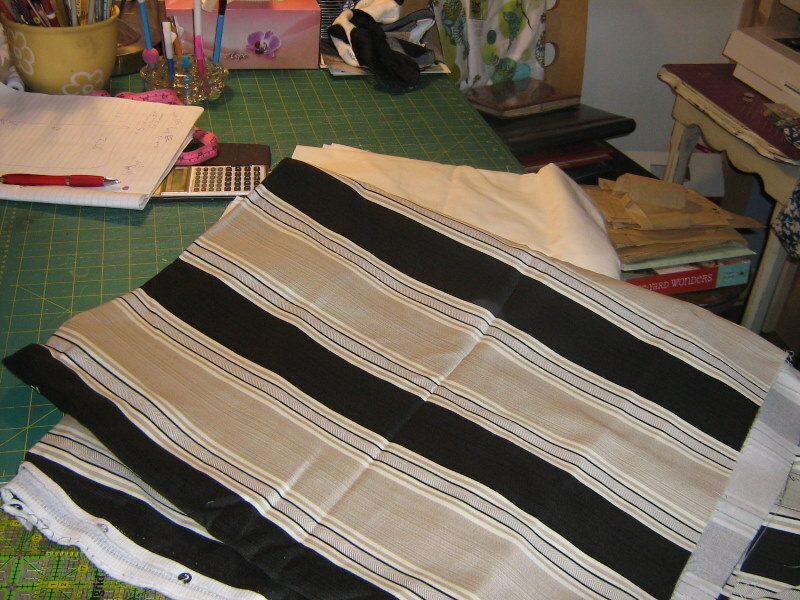 I cut the face fabric 33 1/2 inches wide and 71 inches long. 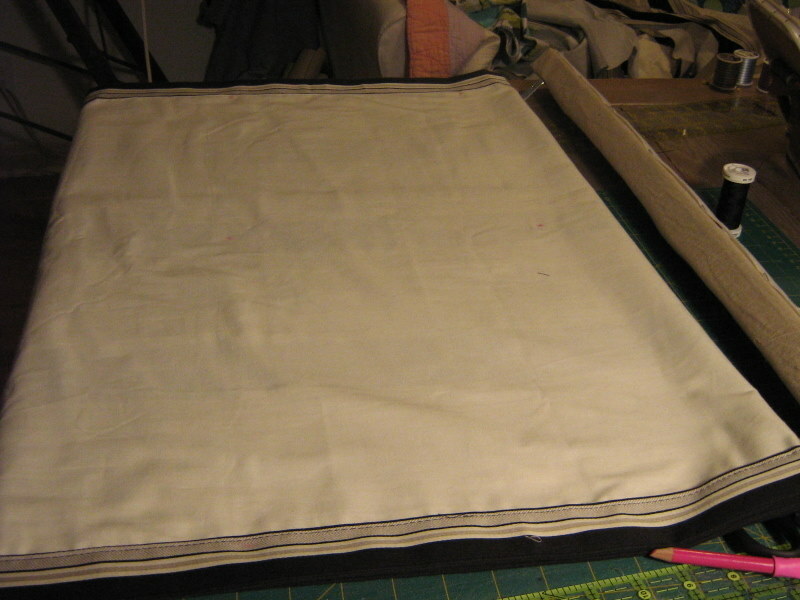 Next I cut the lining the same size as the finished blind size. In this case that was 27 1/2 ” by 63″. That makes it 6 inches narrower than the face fabric and 8 inches shorter. After pressing, I placed the fabric face down and the lining on top. Centring it so there was 3 inches on either side and 3 inches down from the top and 5 inches from the bottom. Next, I fold over 1 1/2 ” and press along one side. I then fold over another 1 1/2 inches and press again. The picture above shows the 3 inches. The one below shows the first fold. The next picture shows the second 1 1/2 inch fold over. I press and pin and am ready to sew. 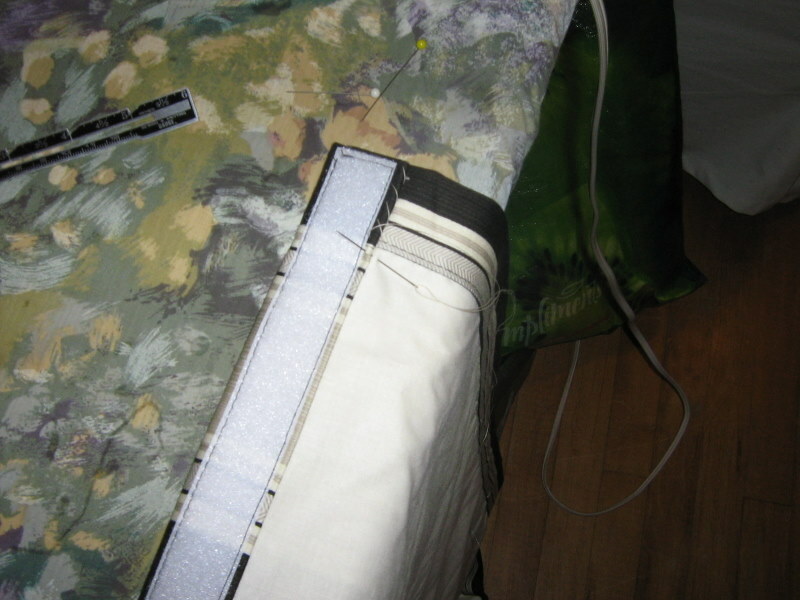 After pinning both sides of the blind, I then sew them close to the folded edge. The side seams are now done. On to the top. attach the soft side of the velcro with your machine. At this point I do some hand sewing. I know that not everyone likes this but, I find it gives a nicer look on the finished project. I refold the 1 1/2 fold down and hand sew it . You won’t have a machine stitched line at the top that shows from the front. The top is done and we just have the bottom to complete. 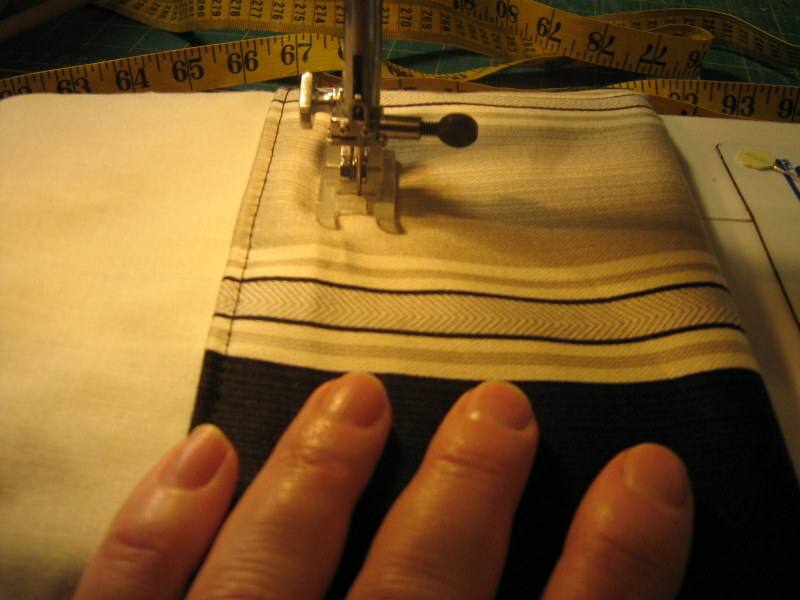 I fold and press a 1/2 inch seam. 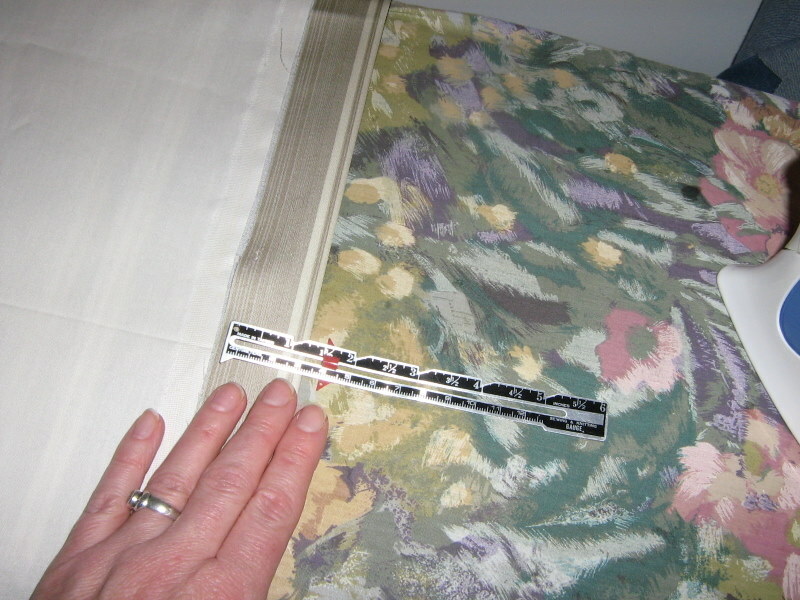 Then I fold up the remaining 4 1/2 inches and press that. 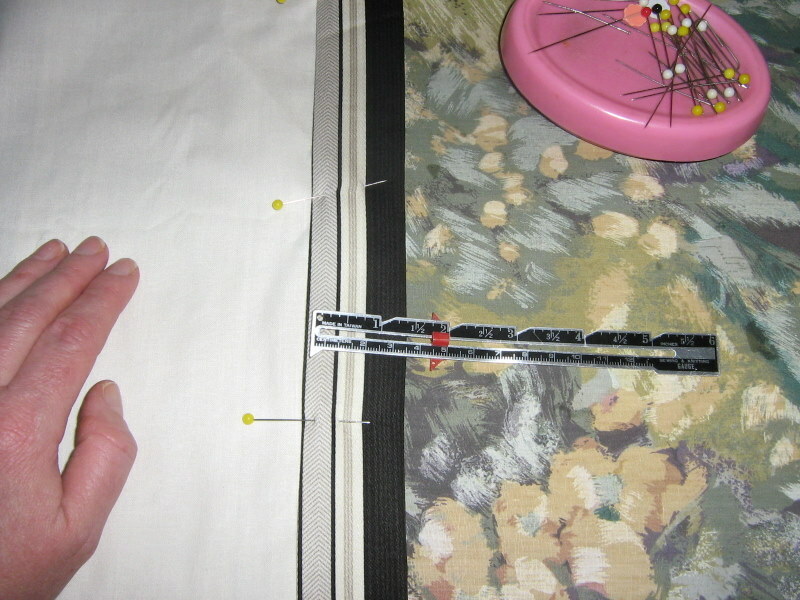 I then pin and before sewing I check that the length is good. If it isn’t for any reason. 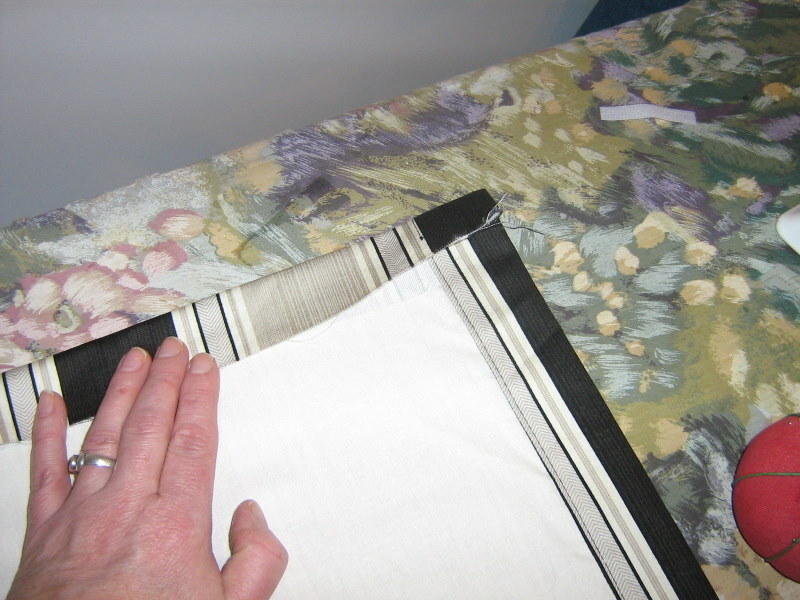 I can make this fold a little less and lengthen the blind or shorten it. 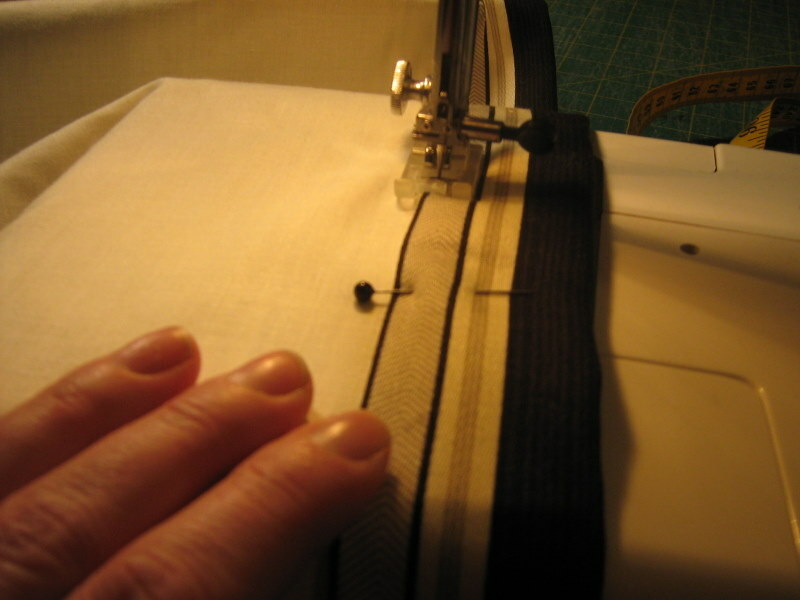 I then sew one line of stitching close to the fold and then one line about 1 1/2 inches below that for a weight rod. The weight rod (a dowel in this case) helps the shade hang nicely. I have used old ibeam tracks and copper pipes. Basically anything fairly narrow with some weight to it. I use heavier weight rods on larger blinds. At this point you may need to get a calculator, a pencil and paper to figure out the placement of the rings. I like to have about 8 – 12 inches between the horizontal rows. On this 27 1/2 inch wide blind I used only 3 rows across. The vertical rows take a little more figuring and measuring. I measure from about an inch below the velcro ( the first ring row) and just above the weight rod pocket( bottom row of rings). This measurement was 56 for me. I then divide this by 8. This number could be more or less depending on the depth of the fold you want when the blind folds up. Larger blinds might look better with slightly larger folds. I took the 56 which nicely divided by 8 to give me 7. I ended up with 7 vertical rows 8 inches apart. I mark these points with a washable marker or dressmakers pencil. I hand sew these rings on as well. 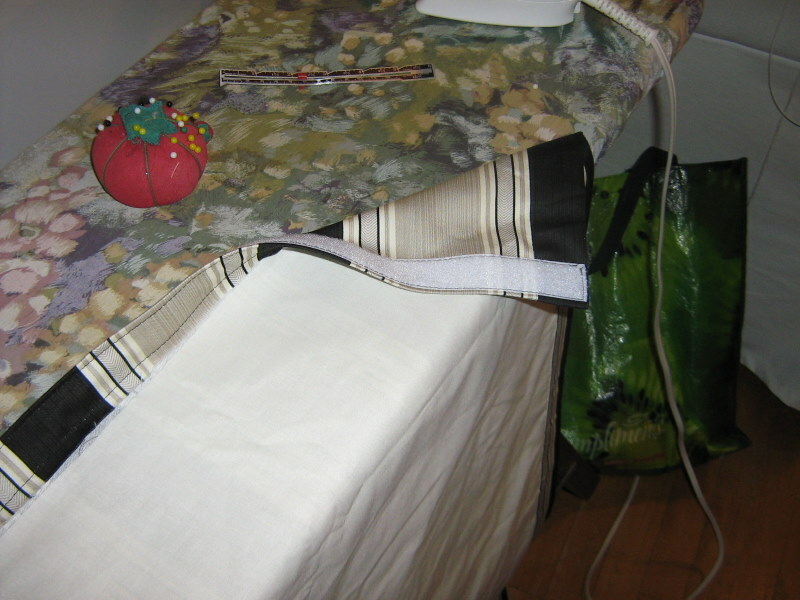 I stitch into face fabric at least twice or three times and the rest just into the lining. I use matching thread and I double the thread. I sew the bottom rows with extra stitches because they hold more weight. It worked out that the rows where all on the black stripe this time. Whew. The Singer Sewing for the Home where I first learned all this from has you sew these with a machine. 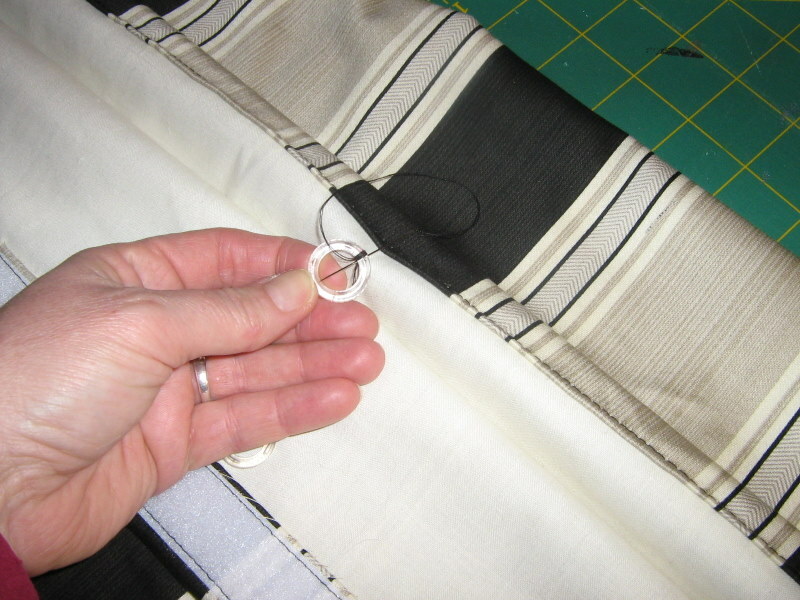 “Attach rings by placing fold under presser foot with ring next to fold. Set stitch length to 0, and zigzag to widest setting. secure ring with 8 to 10 stitches, catching small amount of fold in each stitch. ” This might be faster but I tried it once and didn’t like the effect on the face fabric. At this point you need to know if you want the cords to be on the right or left hand side. 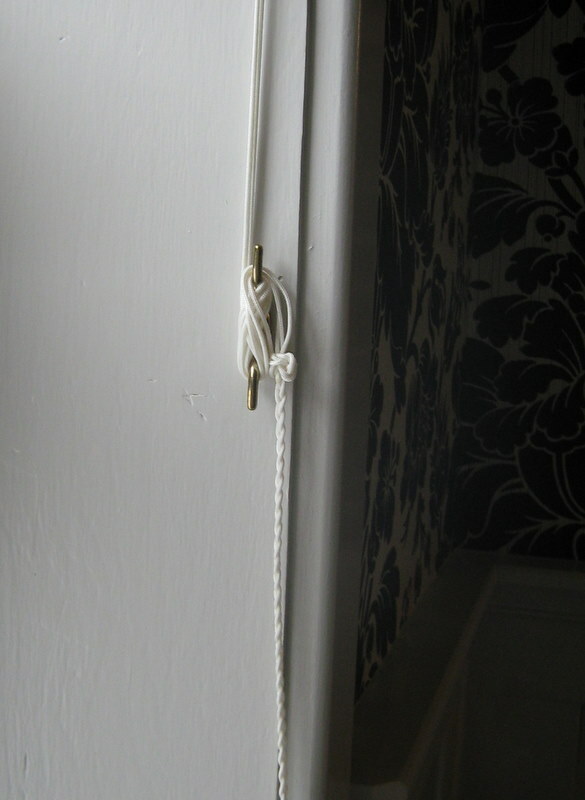 It is time to cut the cording in the various lengths you will need. Start with the row opposite to the side you want the pull. Tie a knot in the bottom ring and secure with a drop of glue. Thread it up thru the row leave enough to go across the top and down half way. Continue along on all rows. 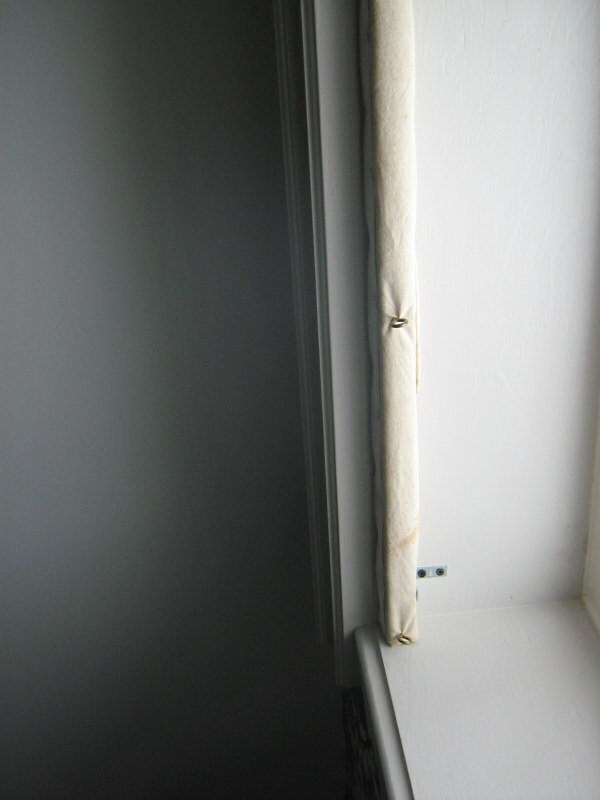 I have a handy man cut me a mounting board slightly narrower than the width of the window and about 1 1/2 inches by 1 1/2 inches. 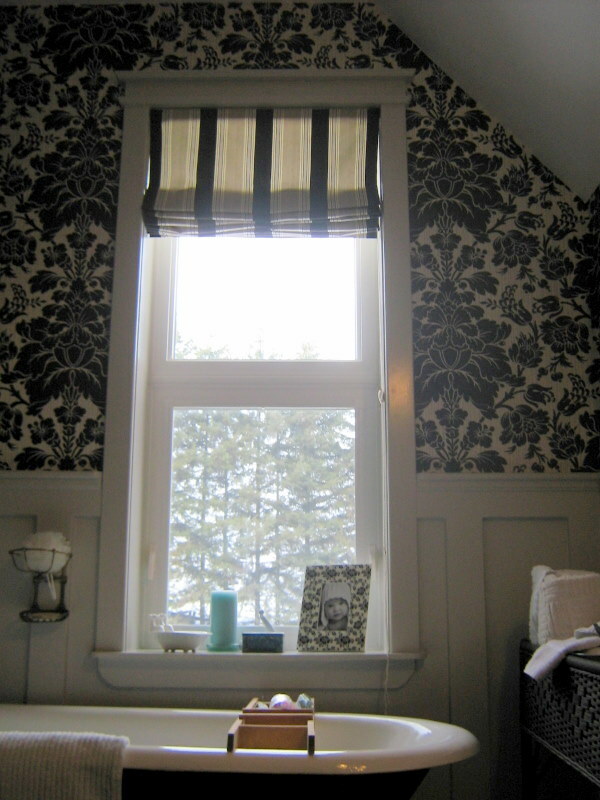 You can paint this the same colour as your trim or mine was wrapped in fabric already from the last blind I made for this window. It matched the lining so I left it alone. You need to insert screw eyes to line up with your vertical rows. 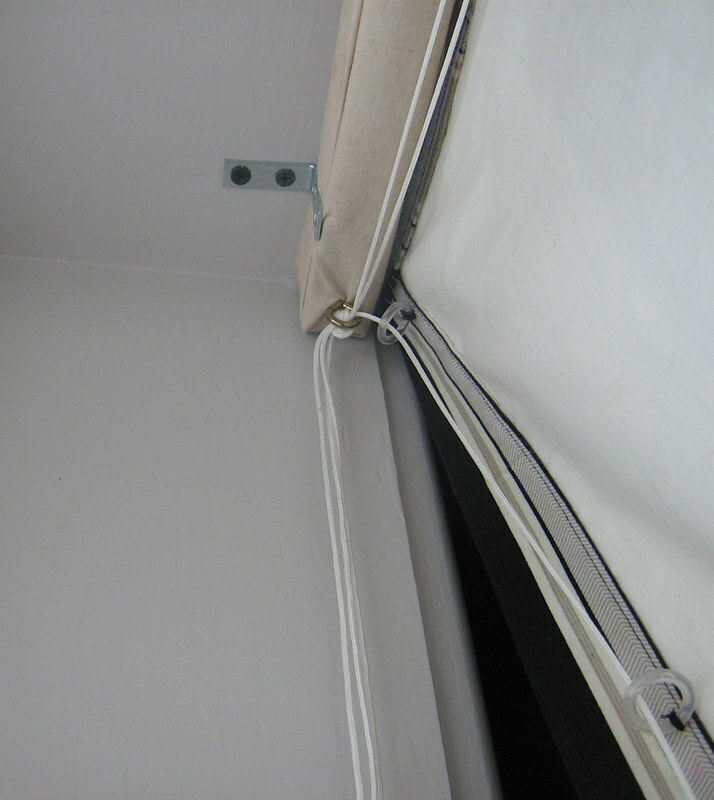 I use L brackets to attach the mounting board to the window frame. 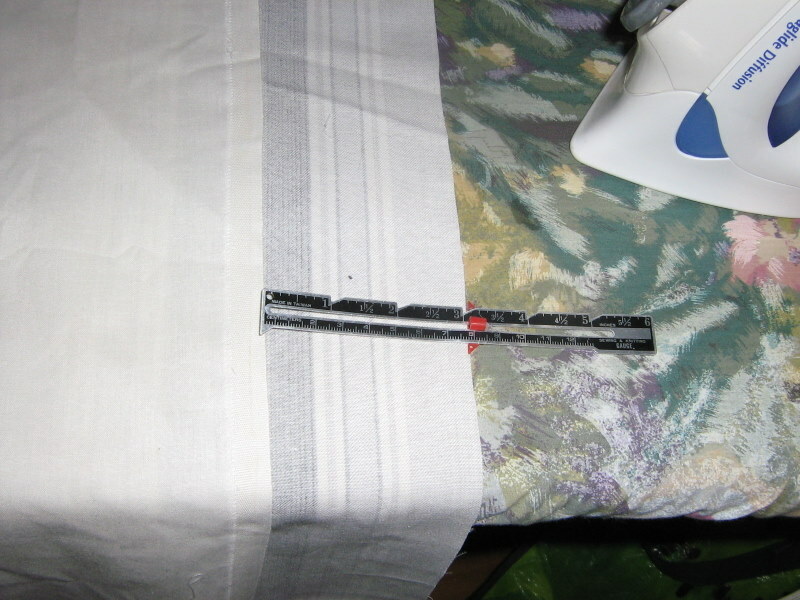 I stapled the hard side of the velcro along the edge which will face out. 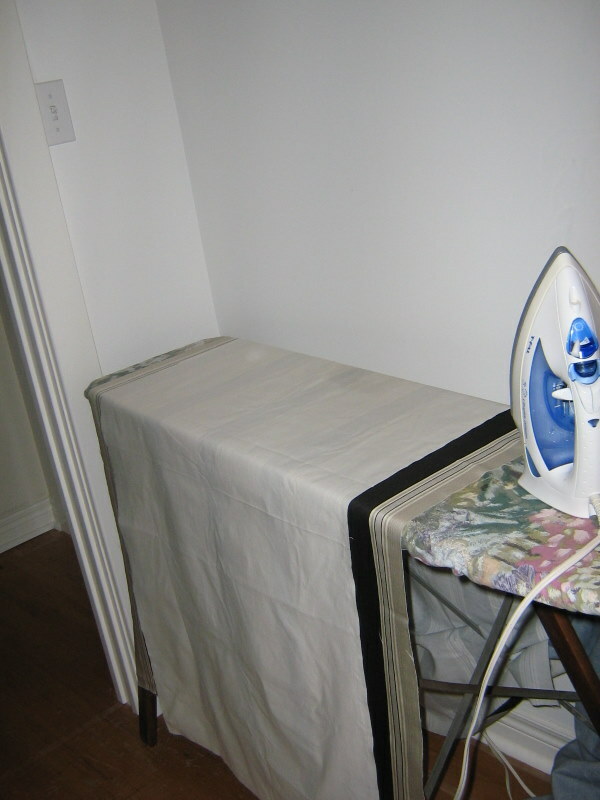 Use lots of staples for this or when you need to reposition the blind you may pull the velcro away from the board. Sew the weight rod pocket closed. Velcro the blind on and thread each cord through the ring above it across and down to the side you want the pull. All the cords will come through the last ring. Make sure the blind is hanging flat. (this was a little hard to do when I was standing in the window sill). Make sure as well the tension in the same on all the cords. Just on the outside of the screw eye tie a knot with all the cords so they don’t slip through the screw eye. 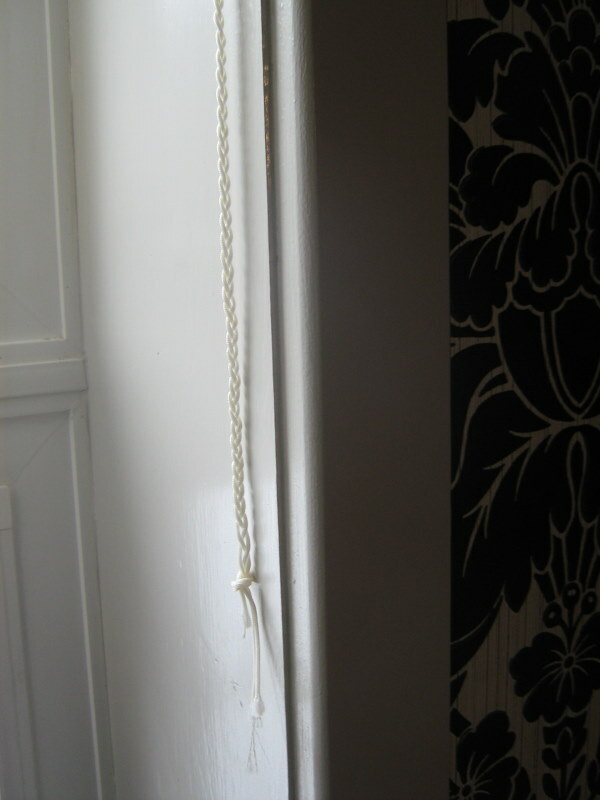 I usually braid the strings from this point and find a knot cover or an interesting bead. (haven’t done this yet though). I will at least cut the cords even. ..soon. Last step, I promise. Attach a cleat. And make yourself a lovely tea with honey because you deserve it. Well I do anyways. I usually keep it all the way up for a few days in order for the fabric to form a memory. Really! It will. I hope someone will find this useful. I have made many many blinds. Roman, hopple, large, small, sheer, heavy canvas, more than I probably remember. Feel free to ask questions. I would love to help. Where the Romans really blind? 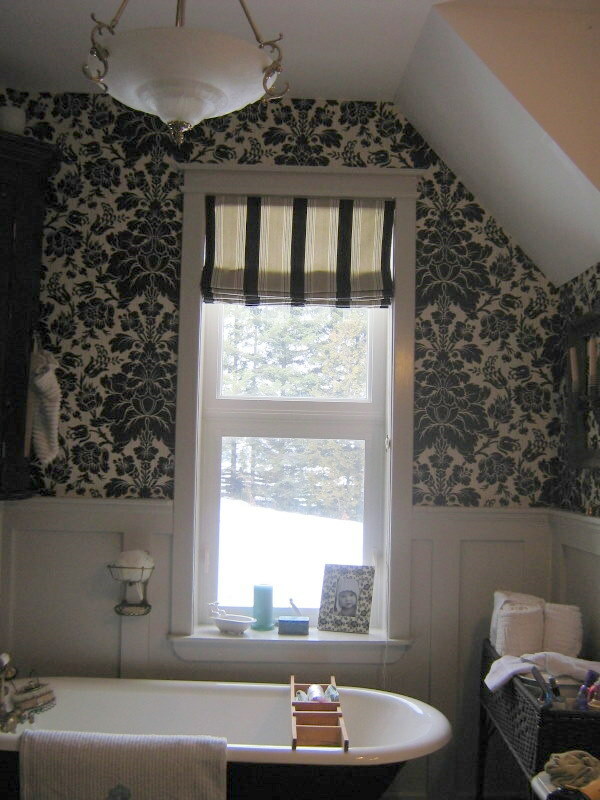 So, I finally got to it and made the roman blind for the bathroom. That is really the final project in there so I can call it finished. Pretty much anyways. Making romans is really pretty easy. It is for a small window like this anyways. I basically follow the instructions in the Singer Sewing for the Home book. Old, but still very useful. Hey, so am I. ha . 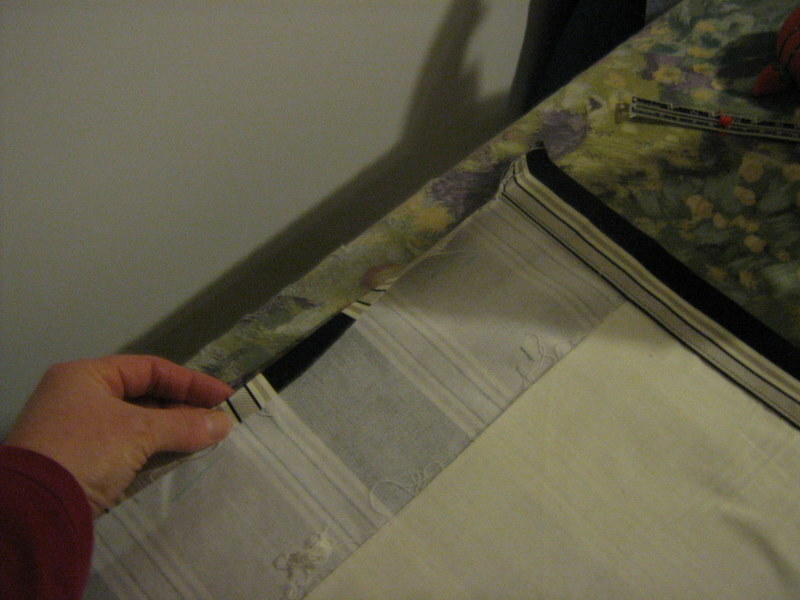 I use velcro to attach the blind to the mounting board and the book says to staple it. I like the idea of taking it down to dust or wash if I have to. Really, will I? Probably not. I did take pictures along the way and plan to put together a tutorial on making romans, but that will have to wait for a day that I’m not painting a RED runner on my stairs. Fingers crossed that the tape works. 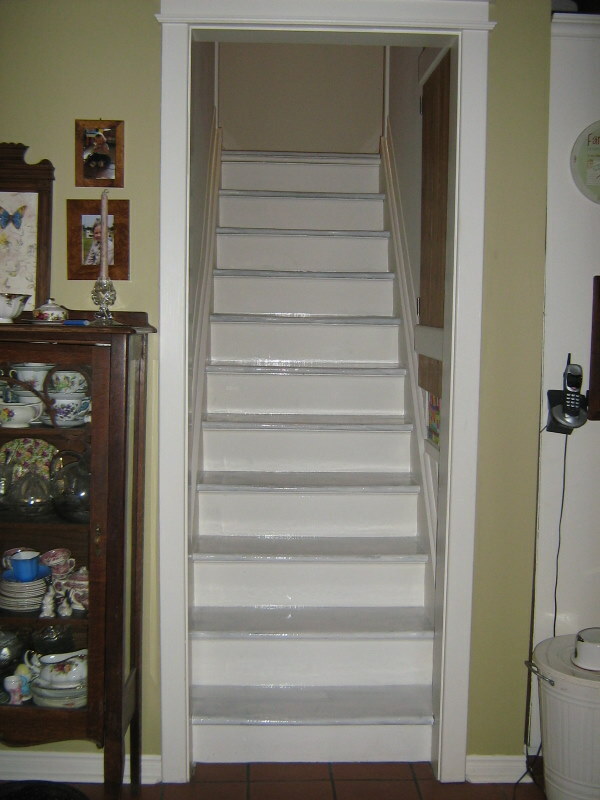 I have managed to get 1 coat of primer and two coats of finish paint on my stairs without any of the four dogs or our cat walking on them. We have four now because we are babysitting two for two different families. Crazy, but that’s what happens when you have a farm and lots of room for pets to roam. Anyways, I have to get out of here from time to time and when I find myself in town I have a hard time resisting a good antique market or thrift store and once again I found myself in one a couple of days ago. I found this. 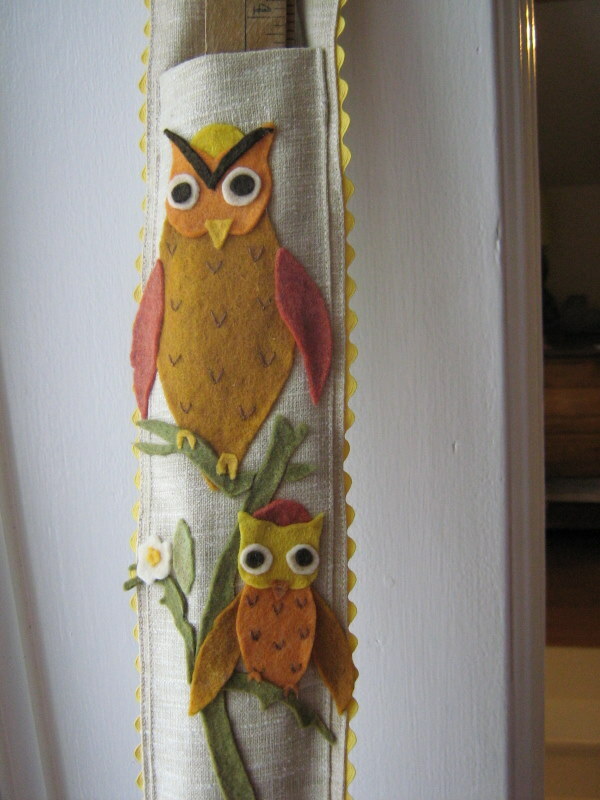 Not only does it have one of my favourite things on it, owls but, it is absolutely useful! 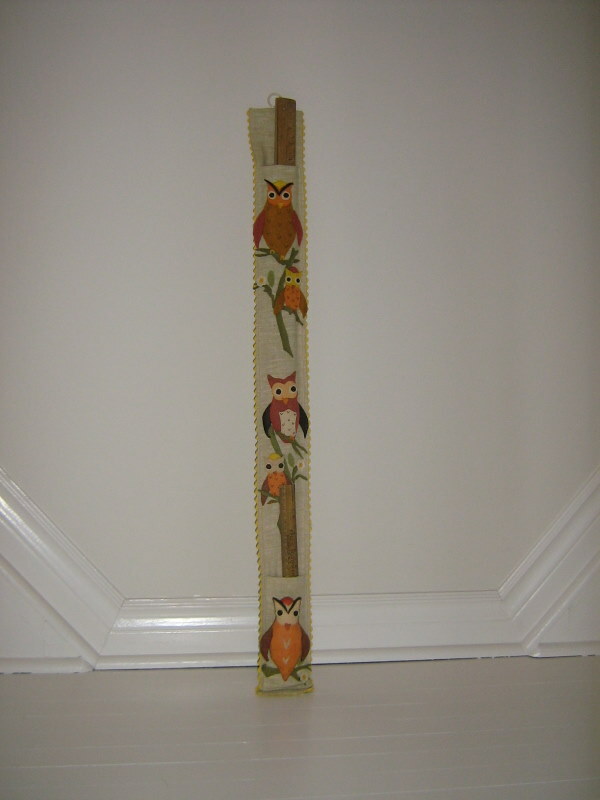 It’s a yard stick and ruler holder! I couldn’t resist for $8. A closer view will show you the hand-made details. 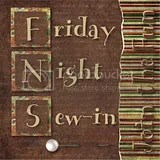 It is made from felt appliques on linen and there is some embroidery as well. 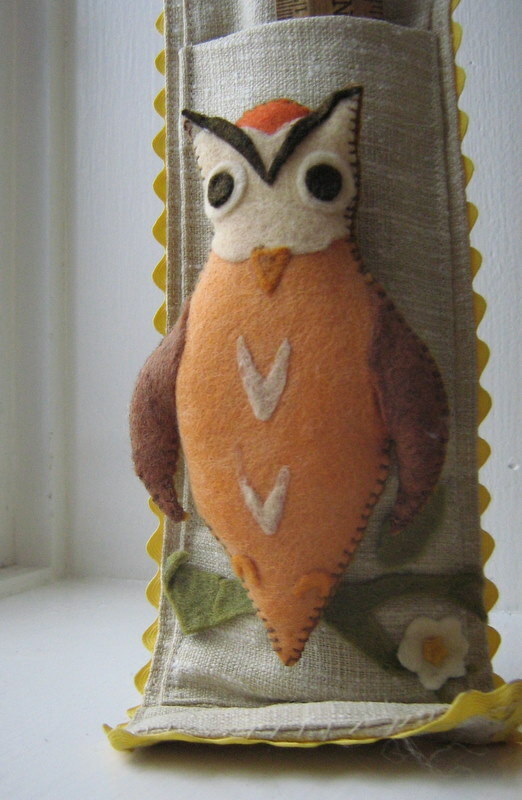 The bottom owl is actually stuffed and then applied . The edging is yellow rickrack. I must make a few of these for gifts and maybe to sell at the farmers market this summer. I also found another weakness of mine. 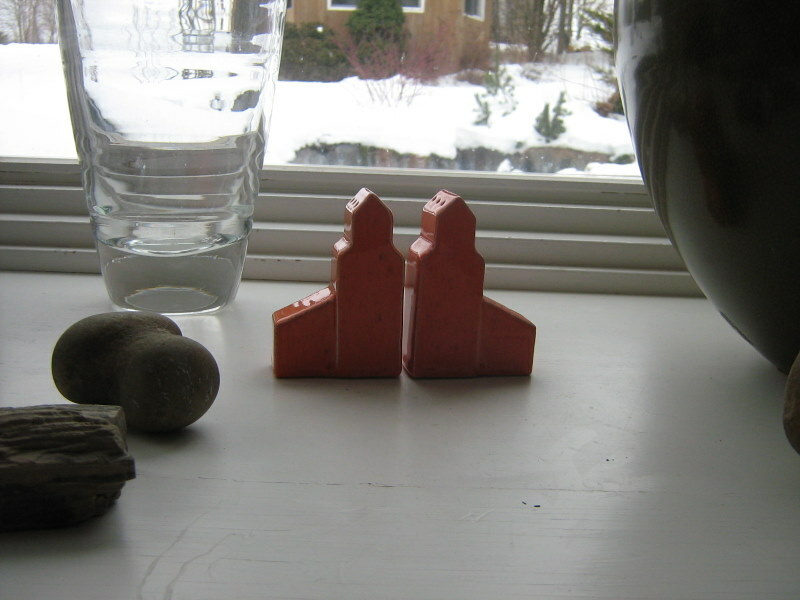 Salt and pepper shakers. They have Saskatchewan Council for Crippled Children and Adults. Saskatoon. on the bottom and they are missing their stoppers. I’ve behaved myself and not bought any s&ps for quite sometime, but when they speak to me, I must relent. My husband’s family is from Saskatchewan and I’d love to go sometime. I’ve been really inspired lately by some pictures I’ve seem blog surfing. 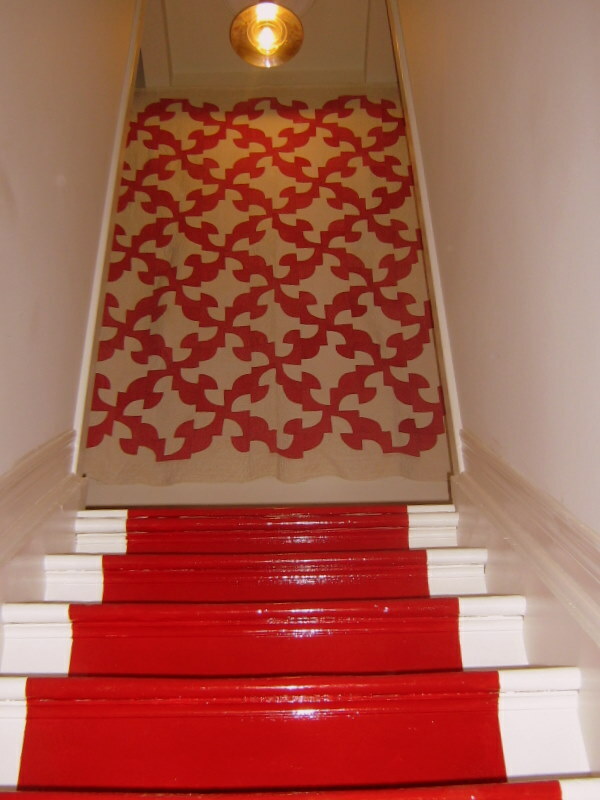 After I’ve been telling everyone that I was going to paint my stairs out white and paint a red runner. I have received a sign. 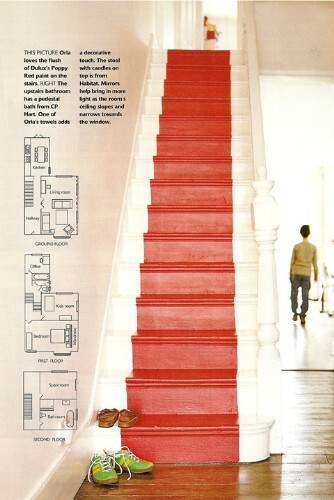 My latest issue of the much loved Canadian House and Home Magazine has arrived with a great photo on the cover. That’s it I thought I’m doing it, and so, it begins. This will be a Three Step Process over the course of a few days. 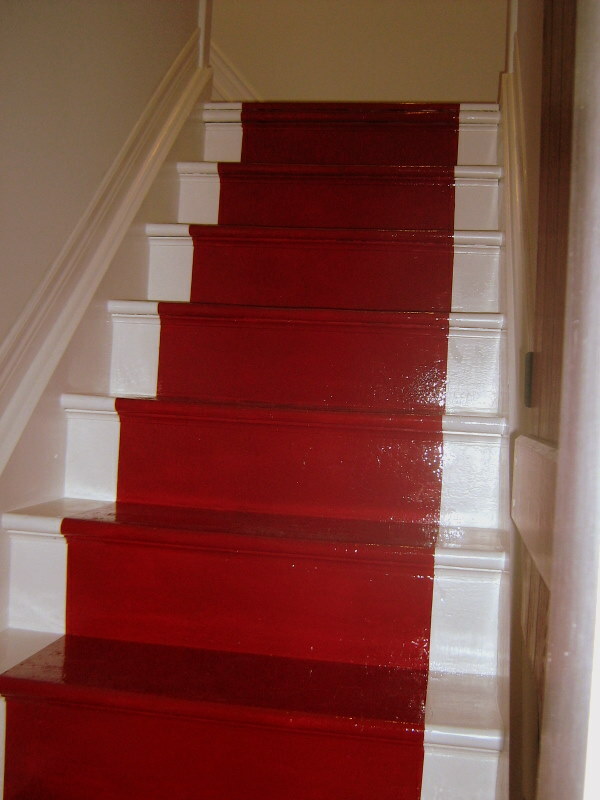 I purchased Benjamin Moore’s oil based Underbody, Oil-based Pearl Collection(210-1B) in Simply White(oc-117), and one quart of Brilliant red in Oil- based enamel wood and metal paint(133-23?). 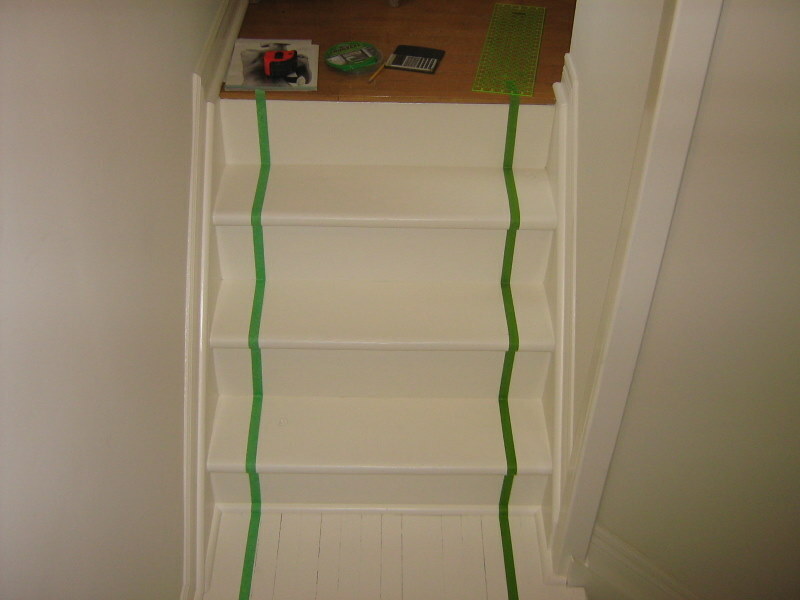 I also used a sander, rags, mineral spirits and the best painters tape you can find. Here is the before, they are pretty beaten up from years of use as well as an extensive reno which we didn’t bother to protect them from. I gave them a light sanding with my Black and Decker Mouse. I concentrated on the areas with the most wear because that is going to be the first place for wear. 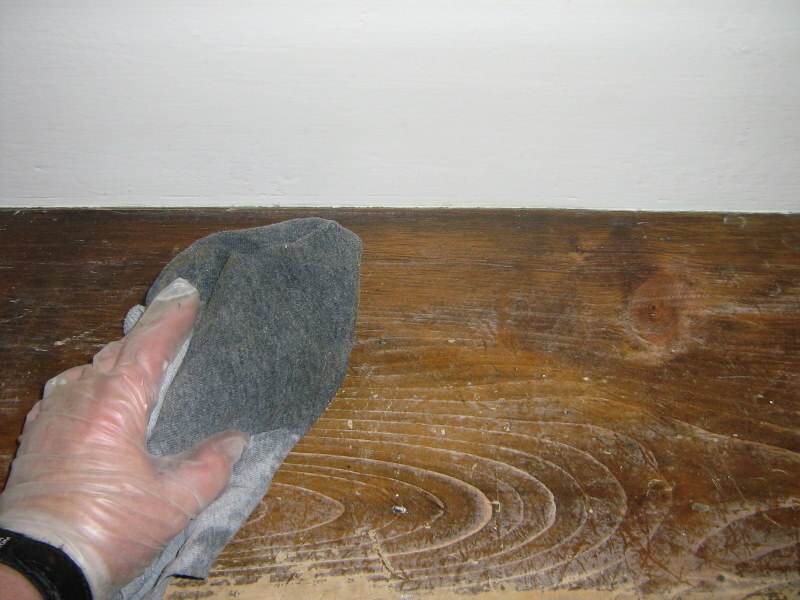 After sanding and vacuuming and I wiped it all down with a mineral spirit dampened rag. 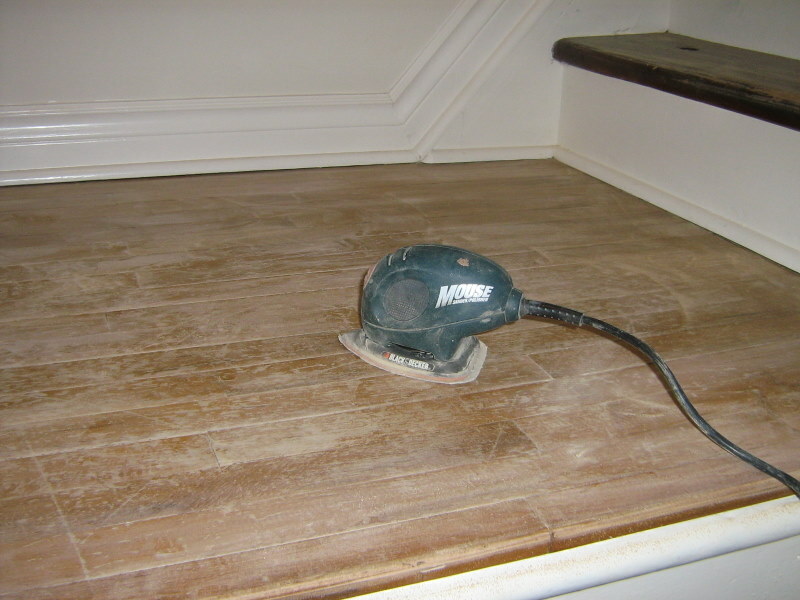 This really picks up any dust that the vacuum misses. 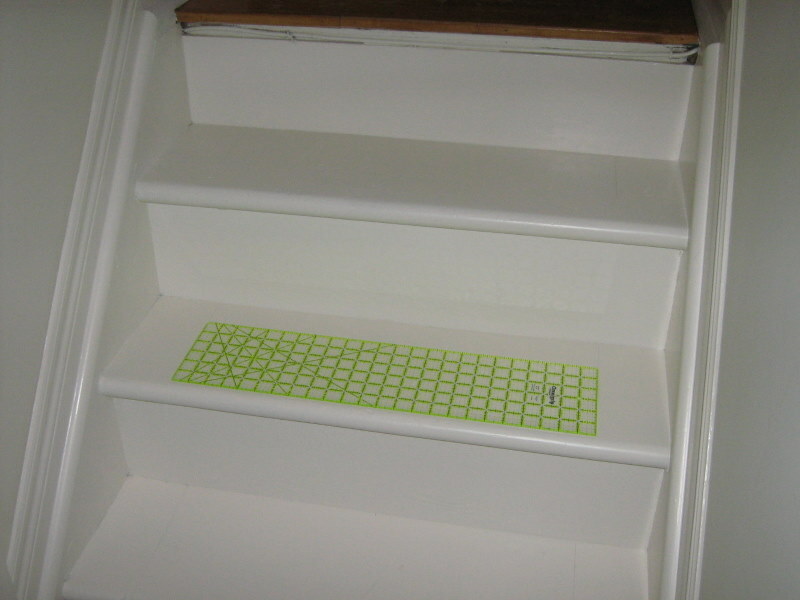 You could also use a purchased tack cloth for this step. Time for the primer. I applied all the paint with a brush. I just am too lazy to get a tray and roller dirty and then have to deal with even more things to clean or store. It didn’t take long because I was just doing the treads. 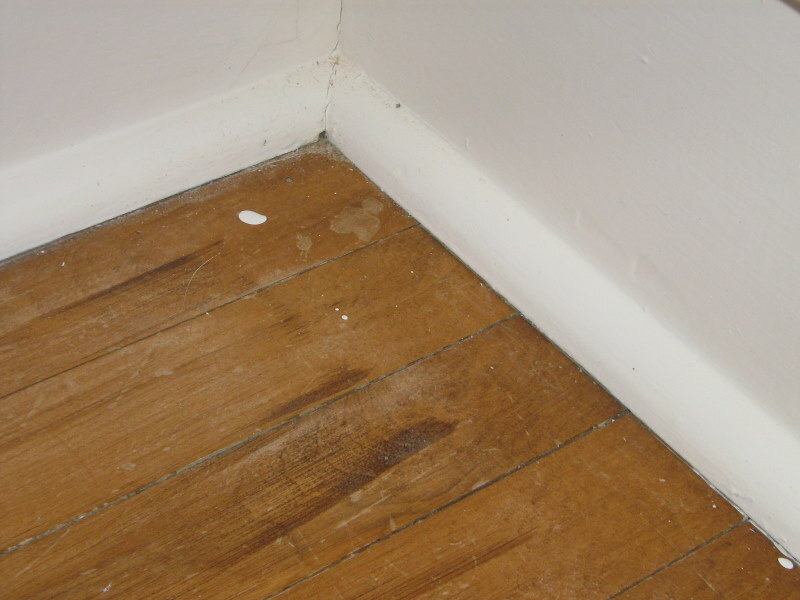 Not too often do you not have to worry about getting paint on the floor. It felt a little strange. I left it to dry for a full day, because I was working but 12 -14 hours would probably be fine. The hallway looks so much brighter already. 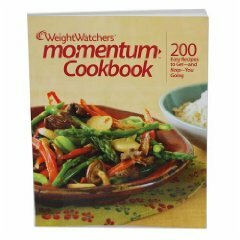 I purchased this book at my weight watchers meeting and made several good meals from it. I made this tonight and it was really good. I will definitely be making it again and again. You can’t buy anything like this in restaurants around here. The best part is you know what you are eating, no hidden calories. 1. To make the dressing, whisk together the orange juice, vinegar, mustard, and maple syrup in a large bowl. 2. 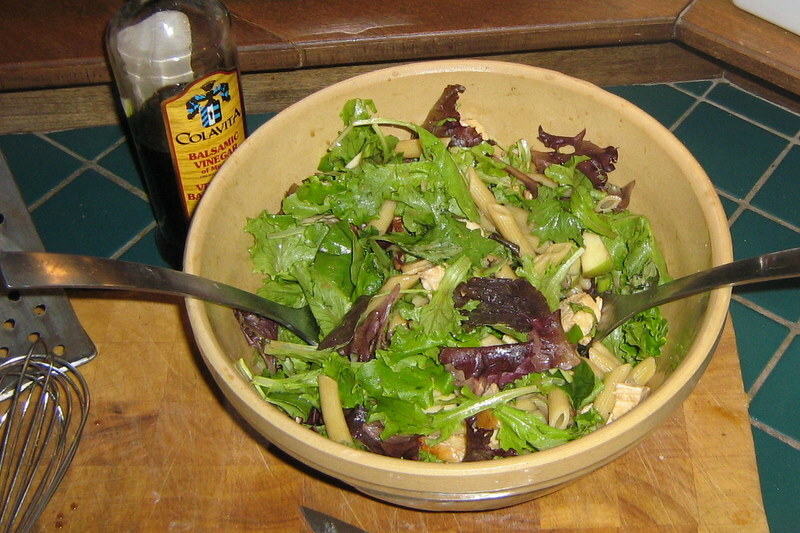 Add the pasta, chicken , pecans, apple and shallot to the dressing; toss to coat. 3. Divide the arugula evenly among 4 plates. Spoon the pasta salad evenly on top. As I try more recipes I’ll share them here. I really wish I had kept up this blog but, I’m going to give it another shot this year. I have high speed internet now and my computer recently died so I added a new hard drive and while I was at it, a whole bunch more memory. With the purchase of a laptop for my 13 year old I hope to have more access to the computer this year. Smart thinking eh? Sew. Sew for the house, for my family and to sell at the new local farmers market. My daughter has been after me to get a booth at a nearby market to sell her jewellry and my sewing. This is the year! It will be a great education for her and perhaps a little extra cash for me. I also hope to gain a little confidence in the process as well. Finish decorating the house. I realize I will never be finished completely but I want to be on the Bobcaygeon House Tour this year. I have been asked for the last couple of years and it seems we are always in a state of renovation. The house won’t be perfect (hardwood upstairs needs refinishing) but, I hope to be almost there. Purge. I have an auxillary sewing room in our barn. It is a complete disaster. Before I had my girl I use to sew out in the barn. 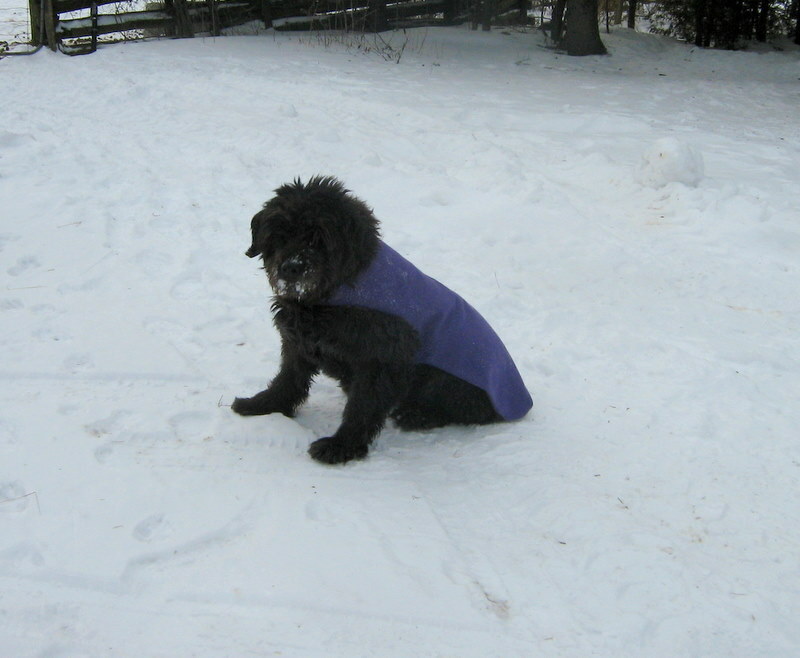 There is a electric heater out there and lots of shelving and a huge table purchased from a sewing store closeout. I even have an old pattern cabinet. I don’t think I will ever sew out there now that we have built a room in the house for me but I still need it for the many many meters of fabric. It has become a storage place for holiday decorations and items I may want at our cottage (which is at date, not built yet). Hoarder? ya maybe a little. I could post pictures but, that would only serve to embarrass me and make you feel better about yourself. Lose Weight. Big surprize here I guess. Who doesn’t make this resolution? Well, I have been losing. Some 11 pounds to date. Thank-you very much. I have been really good at attending my meetings (weight watchers) and I expect to get to goal this year. Our leader has suggested a goal for the first day of spring. She is going to have up write it down and seal it in a envelop which we will open in the spring and rejoice at our success. RIGHT?!! Right. I have 10 pounds to go until I am within the healthy range. I may want to go a little lower than that though. We shall see. Speaking of fabric store closeout. My local store, Fabricland in Lindsay, is closing its doors. So sad. I will have to drive 45 minutes to Peterborough. I use to work at this store some 13 years ago. I know many of the ladies there and am very sad they are losing their jobs. The store has continued to see growth even with the recession but, management says it isn’t big enough to hold the whole product line and rent is too high. I really hope something can be done before it is too late. Well I should go excercise. Twenty minutes on the eliptical. Wish me luck.